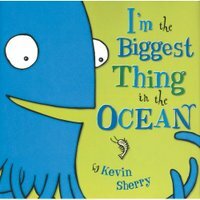 Kevin Sherry made his children’s book debut last year with I’m the Biggest Thing in the Ocean, which was one of my favorite books last summer. The illustrations in this story about a giant squid with a big ego are exactly the kind of bright, big, bold stuff that the under six set love during read alouds. The squid is very funny, and kids do pick up on the lesson about being too full of yourself. So I was very excited about the release of its sequel last month. 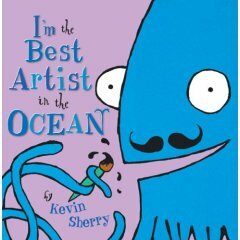 I’m the Best Artist in the Ocean has all the great qualities of the first book, but it’s a little more playful and sophisticated. I think it would appeal to older kids as well as preschoolers. There’s tons to look at, and the double fold illustration at the end is pretty awesome. This interview with Kevin Sherry from Publishers Weekly is an interesting look at this new author, too.